One of the phrases Government Digital Service (GDS) uses that has really struck a chord with me “Doing the hard work to make things simple”. This really rings true when we describe how we have gone about trying to improve DVLA’s online vehicle tax service. This service has been around since 2004 and has had over 160 million transactions raising over £22 billion in Vehicle Excise Duty for the treasury. Staggering figures. When you add to that its recent facelift (gone is the much loved car tracking your progress) and the changes to incorporate abolition of the tax disc and Direct Debit you would assume there is not much left to improve. Wrong! The last 2 changes are probably two of the most significant in DVLA’s history. The tax disc after all had been around for almost 100 years, and the direct debit scheme is already one of the largest in the UK. Add in the fact that car tax rules have changed and you’ve a recipe ripe for potential customer confusion. And it’s fair to say that it has not all been plain sailing. Our Contact Centre has experienced unprecedented demand and we’re finding more complex cases are ending up with our casework teams. But, the number of users choosing digital as their channel of choice keeps rising and is now well over 70%. So what’s causing the confusion? Working with our content team and Paul Pod, GDS Designer, we’ve mocked out several prototypes to explain how to tax depending on your circumstance. Mix of visual images of the actual DVLA forms along with text on Version C is brilliant. My wife understood it, who doesn’t recognise V5c by name etc.  I think version C is pretty 'idiot-proof' and clearly identifies where the required info can be found.  Option C is by far the best option as it actually shows you where to look for the number you need to enter. We’ll be launching these new start pages next week, which we hope will make it even easier for users to tax. These are not the first changes we have made. Since going into public Beta last year we have made dozens of changes over 26 sprints. Some going. But with the feedback keeping coming, there’s a lot more to do to make the service even simpler. I like the online tax but you really messed up when it comes to number plate transfers as it has taken 3 attempts to get it right. We were told last year that we should be able to change online the taxation class of a vehicle from Disabled to Petrol or Heavy Oil. Currently this can only be done at the Post Office. We were wondering when this will happen? There are no plans at present to introduce tax class changes online. It would be good to know where you've heard this from? As motor dealers that deal heavily in Motability cars it would make life a lot easier for us if we had the facility to change taxation class from disabled to normal. There are no plans at present to introduce tax class changes online. Although I welcome improvements, the site fails in making users put in their current address. I work in the parking profession and it is a constant problem with keepers renewing their licence with an out-of-date address. Please can you add an extra section asking people to confirm their current address. You could also co-ordinate this with reminding people to inform the driving licence section of a new address. Thank you for your comments Pat, we are always keen to obtain feedback on ways in which our services can be improved. The service aims to make it as simple as possible for customers to license a vehicle or declare it as not being used on the road (Statutory Off Road Notification) by removing any potential barriers to compliance. We understand that customers want to be able to tax their vehicle and use it immediately. We are separately developing other online services to make it easier for customers to let DVLA know when there are changes to their vehicle registration details. A new ‘Tell DVLA you’ve sold or bought a vehicle' service has recently been introduced and we will be looking to extend the online change to vehicle registration services to include change of address in the future. It is our intention to link each of these services to create a seamless journey for the customer, allowing you to update your vehicle registration details and tax all in one go online. Will Northern Ireland new keepers be able to tax online. Or as a car dealer will there be a facility for us to tax cars for new keepers online? Yes NI customers have been able to tax on-line since July 2014. Dealers can tax on-line on behalf of their customers. I'd also encourage you to Tell DVLA you sold or bought a vehicle from the motor trade. This means you don't need to send in the registration certificate V5C to DVLA. I should add though that while existing NI keepers can tax online or by phone, since July 2014, new keepers are unable to use the online service as we're unable to check their vehicle insurance details. NI new keepers/dealers(on behalf of new keepers) should continue to tax at a Post Office® branch that deals with vehicle tax. System fails when no new keeper supplement present, I wish to tax vehicle for it to be legal(pay DVLA) but as dealer didnt hand over new keeper supplement we are stuck in limbo and unable to tax vw beetle for my daughter. Options involve waiting four weeks for V5C then if it fails to arrive complete a V62 form and pay extra £25 plus either 6months or a year tax upfront no direct debit option then waiting upto another ten days for this to be processed, meaning my daughter has to be without a car for upto 6 weeks. Why is it so hard to give you money I have current v5 doc ref but online system stops me paying, please advise on best course of action?? I’d advise you not to buy a vehicle without a registration certificate (V5C) – see link to our ‘Don’t buy a vehicle without a V5C (logbook) - which gives advice on buying and selling a vehicle without a V5C and how to tax the vehicle. The seller only had front page of v5 I completed my daughters details on it and also got a copy of v5 ref number not sure why it matters if I have doc in my name as just trying to make car road legal by purchasing tax? completed a full check on the vehicle and didnt foresee any issues but when tried to use V5 ref halted from purchasing tax. The length of time to complete this process I am sure increases the number of untaxed drivers out there. Why have you removed the ability to tax a HGV on line or at the post office when a SORN is in place? we now have to POST the application to Swansea - are we back in the dark ages? The ability to tax a HGV online or at the Post Office when a SORN is in place is still available. No changes have been made to this service. I have just tried (3.50am 30 july) to Tax my car online using my V5C. There is no option to tax as the Existing Keeper (using the V5C document reference number) the selection button on the image (top of page) no longer exists, ditto the second button - Only the V11 16 digit input box and a link to new owners etc. I am sorry that the changes to the screens prevented you from finding the option you were looking for. 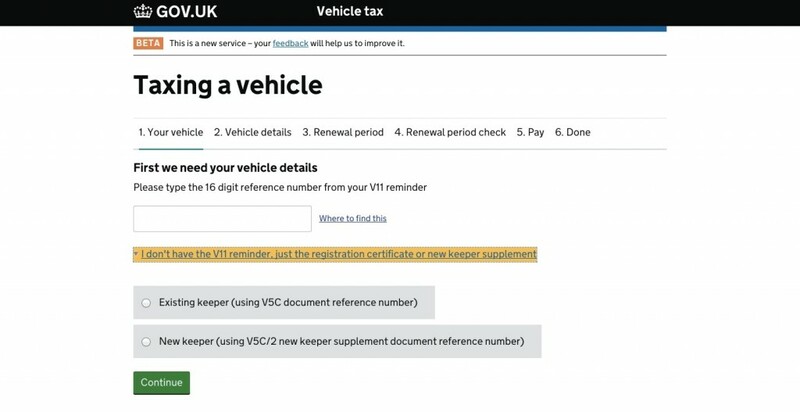 The option to use the V5C reference number to tax a vehicle is still available to customers, by clicking on the link stating ‘I don’t have a V11 reminder in my name’ below the V11 reference entry box. You are presented with an option stating ‘I have taxed, or declared the vehicle off road before’ which leads you to a page which asks you to enter your V5C reference number. Customer feedback and statistical analysis of use of the service showed that over 80% of customers use the V11 reference number to re-tax their vehicle, the presentation of the options was amended to reflect this use and reduce customer confusion over the entering of their reference number.